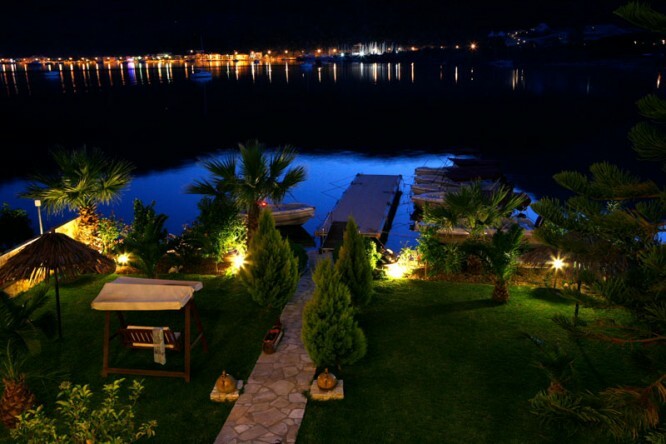 George Studios is located at Lefkada (or Lefkas) island. On the eastern seaside of Lefkada there is the marvelous, quite bay of Vlicho where situated the small fish village Geni. All room types afford: Balcony, Air condition , Bath-shower. Refrigerator, Hair dryer, Kitcen facilities. Parking, Boat dock facilities, Motorboat rentals, Playground, Water sports (water ski, wakeboard, banana, parachute, tubes), Garden (umbrellas and sun beds), Barbeque, Laundry. At the surround area of Geni there are a lot of small, seaside fish tavernas, quite and peaceful cafe and Mini Market. Additionally, 4 km far you can find restaurants, night clubs, gas station, car rentals, pharmacy and medical service.